In today's guide you're going to learn why you NEED a solar pool cover for your swimming pool. A solar pool cover can heat your pool naturally, cut down on energy and water costs, and even help your water line from sinking. Basically, they keep your pool heated with having to spend an arm and a leg on utilities it would take to run a traditional pool heater. How long do solar covers last? As you already know, a regular pool cover helps to keep out debris and cut down on maintenance. And a solar pool cover serves those purposes with a couple other added benefits: they also heat your water and reduce evaporation. They come in several different types and sizes, but they all use the sun’s energy to create a warming effect in the water. According to INYO Pools, the average gas pool heater uses about 4 gallons per hour with propane or 4 therms per hour with natural gas. And an electric heat pump uses about 5 kilowatts per hour of electricity. So, depending on the prices of utilities in your area, you could be looking at a pretty hefty energy bill with either option. A solar pool cover uses none of these resources. You do the math! Did you know that without a cover, your pool will lose an average of two inches of water a week? It doesn’t sound like a lot, but depending on the size of your pool, this could amount to somewhere between 10,000 and 20,000 gallons of water per year. That’s a whole lot of water to replace, taking up valuable resources and costing you money! On top of the added cost, though, is the fact that 75% of your pool’s heat loss is directly due to this evaporation. Solar pool covers almost entirely eliminate evaporation, saving you tons (literally) of resources every single year. Pool chemicals are also reduced with evaporation, or diluted with added water. A solar pool cover can reduce your chemical reduction by up to 60%, again saving you money and time. Sure, this is true of any pool cover, but it’s important to mention. A pool cover will keep out pesky debris and algae spores, keeping your pool cleaner longer and cutting down on maintenance. With a solar pool cover keeping your water toasty, you may be able to swim far into fall, depending on where you live! There are different types of solar covers out there, so you want to know the pros and cons of each before buying. CONSERVES ENERGY - This 14-mil blanket covers your swimming pool and employs solar heating to increase the water temperature by up to 15 degrees Fahrenheit. MINIMIZES HEAT LOSS: Our insulating thermal bubbles provide effective heating all summer long. This blanket is packed with innovative cells ensuring your swimming pool stays warm through cool nights and cloudy days. 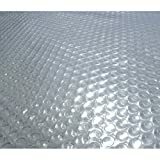 Solar blankets are also sometimes called bubble solar covers because they look a little like bubble wrap. Actually, a lot like bubble wrap. But don’t use bubble wrap—just trust me on this one! A solar blanket is made with little thermal bubbles all over it that captures the UV rays of the sun and keep your water toasty warm. They also retain the moisture from your water, helping even more with evaporation control than a regular cover. To get the most out of your solar blanket, you'll need to buy one a little bigger than the size of your pool. When you get it home, you will unfold it and place it completely over the pool and then trim it with scissors to fit. They do come in different thicknesses, so you might need to use utility scissors if household ones won’t cut it. Solar blankets are great, but get all the facts before you buy one. There are good and bad that come along with anything you buy and these are no exception. Solar sun rings are a nifty alternative to a solar blanket, albeit a little more expensive. They work a lot like a solar blanket, absorbing heat from the sun and passes it on to the water. The main advantage of the solar rings over solar blankets is the ability to purchase as many as you need to cover the area of your pool rather than having to trim down a cumbersome sheet. They also attach to each other with magnets, making them easy to install and keep them on the water. The main drawback of solar rings is the water area left uncovered, making it easier for debris to enter the water, and making them less efficient than other covers. Another alternative that covers a bit more area is solar squares or mats. They are the exact same type of product except for the shape. Liquid solar covers are just what they sound like—a chemical additive that comes in a dispenser or pill form that is liquid! When added to the pool, it creates a layer on the surface that retains the heat it absorbs from the sun. A liquid solar blanket works best in still water and doesn’t harm swimmers or pool filters. It’s made to be dispersed into the water a little at a time and designed to heat the water up to 6 degrees and prevent evaporation. One of the most valuable qualities of a solar pool cover is that it reduces evaporation, which in turn saves on energy and water costs and consumption. Water evaporates because of the elements. Evaporation is affected by climate, temperature and wind, and a solar cover provides a barrier of protection from those elements. Scientifically, here’s the scoop: A pool naturally collects heat throughout the day, but is usually not enough to keep it heated consistently at various times of the day or year. It traps the heat in and protects the water from the elements. It also prevents heat loss caused by evaporation. Because solar blankets and rings are made of plastic, they will start to deteriorate over time. And because of chemicals and elements like wind and rain, the plastic will start to dry around the edges and bubbles will begin to fall off or deflate. Most manufacturers recommend replacing your solar cover every year or two, but in reality, they will probably last up to three in mild to moderate climates and conditions. Liquid solar covers last until the chemical runs out, usually every 30 days. Because solar covers come in all different styles and thicknesses, it’s important to know which ones will work best for your needs. Value isn’t necessarily measured by cost alone. Look for the most inexpensive among the covers with the most comparable features. Thicker solar covers will usually be more durable. A thickness of about 14 mil and above will last a little longer and take a lot more use than an 8 mil, but a 12 mil thickness is about average. The disadvantage, however, to a thicker cover will be the weight. For thick covers, you will possibly need a retractor that will hold it and roll it up when needed. Obviously, you need to measure your pool and make sure you buy a cover that is a little larger than your pool’s area. Clear blankets are the best choice for effectiveness because they allow more of the sun’s rays to pass through and heat the pool, but you need to look for one with high UV resistance so that the plastic will resist damage. If you opt for a pricier model, choose one with a warranty so that you can guarantee it will be replaced if it wears out within a certain amount of time. When buying a solar blanket, you may not find one the exact size that you need. If this is the case, you will want to buy one a little larger rather than a little smaller, lay it out over your pool and then trim it with scissors to just overlap the edges. For solar rings, you will also measure your pool and buy the amount of solar rings to fully cover the area of the water. It’s best to leave as little space on the edges as possible to maximize their efficiency. There will always be a little bit of a gap, but try to minimize it the best you can. Liquid solar cover is pretty easy to use. Just measure your pool and follow the manufacturer’s instructions for how much to use. Solar covers are not made to last forever. They're made out of certain types of plastic, which is affected by elements such as UV rays and chemicals. But there are ways to prolong their lives as long as you can. Keep your chemicals balanced—especially chlorine. Anything above 2 ppm will start to erode the plastic of your pool cover quickly. Low pH levels will also affect the strength of your cover. Keep them at about 7.4. Use a solar cover reel to reel up and store your cover when not in use. This will keep it from being needlessly tugged, drug and folded. Buy the thickest solar blanket you can afford and/or handle. The thicker the material, the longer it will last. Never leave a solar cover on while shocking your pool. Excessive chlorine will eat your plastic like Pac Man. Never allow anyone to swim with a solar blanket on the pool, even folded over. If the wind were ever to blow it over the pool, it could trap a swimmer underneath it. 1. How do I apply my solar blanket? You will always apply a solar cover bubbles down and you might even tuck the edges into the skimmers to keep it in place. If you have a large pool, you will probably want to consider buying a reel for your cover. 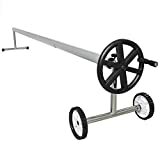 This is just a steel pipe with a handle designed to hold your pool cover and reel it up when not in use. For heavier or larger covers, this is almost a must. 2. When do I use my solar blanket? You can leave your pool cover on any time you’re not swimming. In fact, it’s recommended. During daylight hours, the more you keep the pool cover on, the more efficiently it will heat your pool. After the sun goes down, the cover will keep in the heat it absorbed during the day and also help keep out debris and bacteria. 3. Can I run my filter with the cover on? It may decrease efficiency slightly when using a solar blanket because of the surface area of the water it won’t be able to circulate. But there is no real harm in keeping it on. 4. How do I remove my solar cover? Ideally, if you have a solar blanket, you will have a reel to keep it wrapped up nicely when not in use; however, not everyone wants to spend the extra money. I get it! If you don’t have a reel, it’s best to have someone help you. 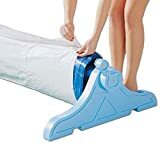 You will each stand on opposite sides of the cover and fold it over in sections like an accordion until it can be stacked at the other end of the pool. With one person, it’s a little trickier, but it is possible. You can do the same thing from the outside of the pool, but with one person, it might start to pull to your side and you will have to go back and forth across the pool to straighten it out. If possible, for a one-person removal, get into the pool and fold from the center end of the cover. Thicker covers are much harder to fold and may have to be pulled straight off, which is also easier with two people. 5. Can I put my solar cover on right after adding chemicals? While you can safely put your cover back on the pool right after you’ve added chemicals, it’s always best to wait 30 minutes to an hour, just to help your cover last longer. And definitely always remove it while shocking your pool and keep it off until chlorine levels return to normal (about 1-2 ppm). 6. How do I clean my solar cover? Solar blankets can start to get an algae build-up just like other pool accessories if you don’t keep it clean. To clean your solar cover, you will need to remove it completely from the pool and lay it out flat on the grass or turf. You'll then use a soft broom or cleaning brush to scrub away any signs of dirt or algae you see. Rinse it well with a water hose and then dry well, either with a towel by hand or by hanging it over a solid-edged fence. For tough algae you might notice growing, it’s okay to use a chlorinated solution with your brush as long as you rinse it away immediately. Don’t leave it on the grass, whatever you do! Since it acts a little like a magnifying glass, you could remove it to find a burnt patch of grass underneath. Solar rings are cleaned the same way. Just lay them out on the grass and scrub and rinse as needed. 7. How do I store my solar cover? There’s no need to stow your cover every time you take it off your pool! You can simply lay it to the side until you’re done. If you have a reel, a solar blanket will simply be stored on that. If not, you will need to remove it from the pool, make sure it is completely dry and then store in an airtight container with a lid. Same goes for solar rings. You can either store them in the bag they came with or in an airtight container. A solar blanket, solar rings or liquid solar cover are never going to keep your pool as warm as a gas or electric pool heater. But you may not need all the heat of a pool heater and you may not want the added cost. In those cases, a solar pool cover is way better than using nothing at all. Just ask your kids when they cannon ball into it first thing in the morning without sticking their toes in first. You also don’t have to choose between them. If you already have a gas or electric pool heater, there’s no reason you can’t also use some type of solar cover with it. Any of these covers will maximize your heater’s efficiency by keeping in the heat that the unit is producing.